The pleasant waves from the Yellow Sea, colourful sails and golden sands form Qingdao´s beautiful beach line and gives the city its profile of a City of Sailing. 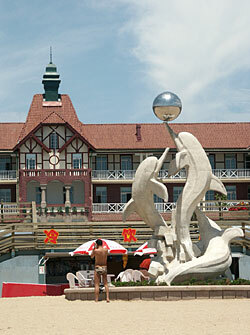 With its face to the sea and mountains in its back Qingdao offers a beautiful scenery in all directions. Add a comfortable climate, green parks, amazing festivals, clear sea water and delicious sea food and you have one of the most attractive cities in the Far East. The city is a cultural combination of east and west. Through the unique architecture in some parts of Qingdao. Qingdao was a German possession 1898 to 1914, and still features astounding examples of Bavarian style architecture, particularly the railway station, the twin-spire Catholic Church and the former German Governor´s residence. And the best beer of China is brewed here, the Germans started the production already in the 19th century.